In this post we are going to cover the uninstallation of connector. Particularly the database connector. The same procedure can be used for other connectors also. For.ex OID connector, AD Connector etc. Please see below the steps for the same. 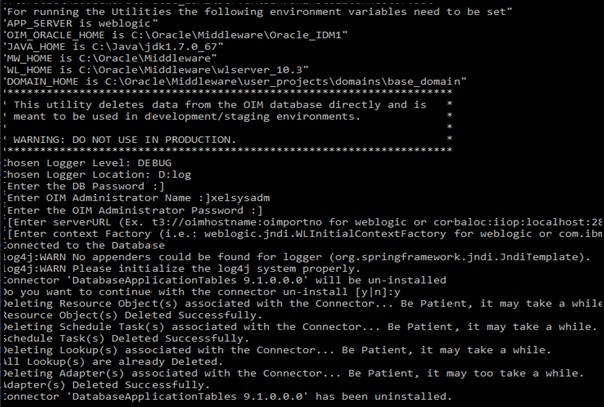 1) Update the "connectorUninstall.properties" file located at "<OIM_HOME>/server/bin" with following parameters. Note: Here OIMDB is the service name. Please provide the service name as per your environment. 2) Set the following environment variables. 5) At last on the above screen you can see the message that "Connector DatabaseApplicationTables 9.1 .0.0.0 has been uninstalled". In this way we have uninstall the connector.